Writing your risk-benefit assessments no longer needs to be a long and tedious process. With this quick and easy risk assessment wizard you can generate professional, personalized risk-benefit assessments for any activity in just 6 steps - giving you more time to prepare exciting and inspiring activities. 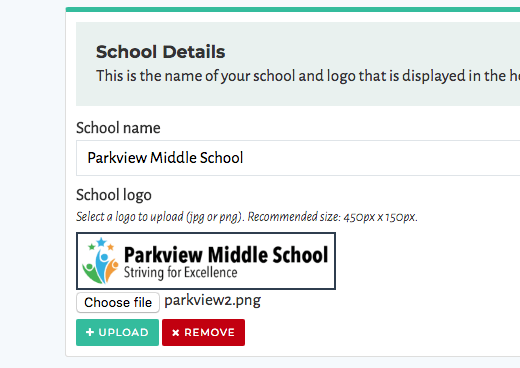 Personalize your risk assessment with your school name and logo. You can update these settings at any time. Your changes will automatically update all of your previously created risk assessments. Enter the details of the staff who will be attending the activity. 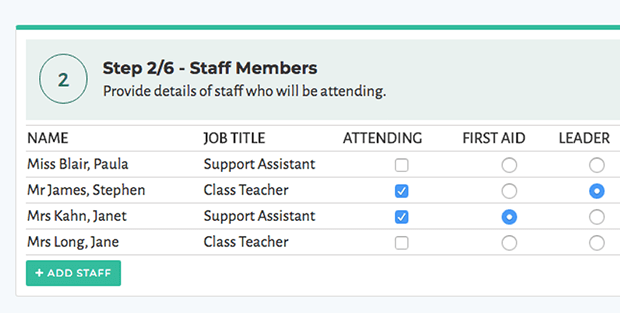 Assign a group leader and a firstaider with 1 click. The Risk Assessment Creator will remember your staff so that you can use them again in future risk assessments without re-entering their details. You can update staff members at any time and this will automatically update all of the risk assessments that they are already included in. This step is where you provide some general information about the activity that you have planned and the location where it will be happening. 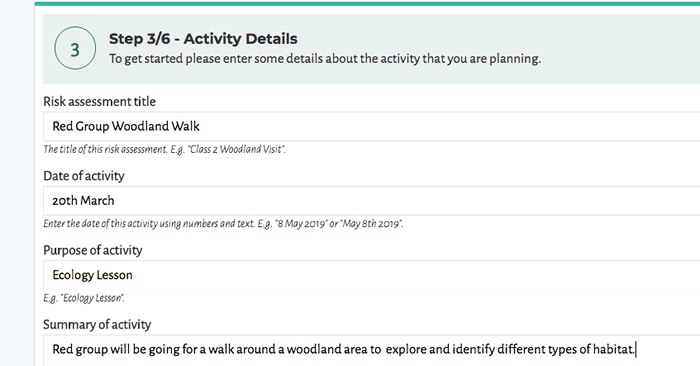 You will also need to identify the benefits that this activity will have (the Risk Assessment tool will give you some suggestions). This step is about the group members as well as emergency contact details and first aid provision. Here you will provide details about the hazards that you have identified and the risk reduction measures that you will put into place. 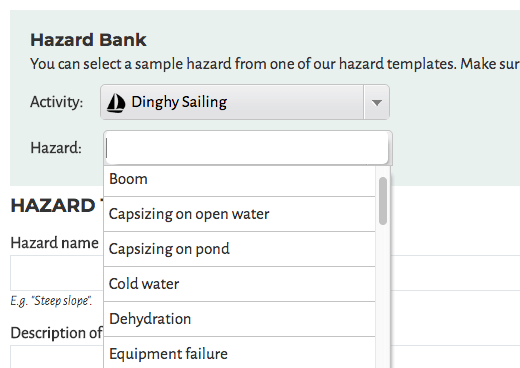 This can be a difficult task but we make it easy with the Hazard Bank which gives suggestions of hazards and measures for a wide range of activities. You can then amend it to match your requirements. For each hazard we have also included an editable benefit to accepting this hazard which automatically gets added to the assessment. That's it! You can enter some additional notes if you wish and then just press save. Your risk assessment will then be generated instantly and available to download as a PDF. Risk assessments are stored in your Risk Assessment area and can be edited as needed or copied to quickly create another risk assessment for a smililar activity.